Decline in cardiac output leads to increased sympathetic tone, increased peripheral resistance (afterload), and increased renin/angiotensin/aldosterone axis. Start at 50 mcg/min, can rapidly titrate to 200-400 mcg/min. You must stand at the bedside to use these doses. Run normal drip setting (10 mcg/min=3cc/hr) at 120 cc/hr for 2 minutes to get same dose. BP lowering as long as the patient can mentate, ambulate, and urinate. after the first hour of treatment. Intravenous nesiritide vs nitroglycerin for treatment of decompensated congestive heart failure: a randomized controlled trial. SO – JAMA 2002 Mar 27;287(12):1531-40. CONTEXT: Decompensated congestive heart failure (CHF) is the leading hospital discharge diagnosis in patients older than 65 years. OBJECTIVE: To compare the efficacy and safety of intravenous nesiritide, intravenous nitroglycerin, and placebo. DESIGN, SETTING, AND PATIENTS: Randomized, double-blind trial of 489 inpatients with dyspnea at rest from decompensated CHF, including 246 who received pulmonary artery catheterization, that was conducted at 55 community and academic hospitals between October 1999 and July 2000. INTERVENTIONS: Intravenous nesiritide (n = 204), intravenous nitroglycerin (n = 143), or placebo (n = 142) added to standard medications for 3 hours, followed by nesiritide (n = 278) or nitroglycerin (n = 216) added to standard medication for 24 hours. MAIN OUTCOME MEASURES: Change in pulmonary capillary wedge pressure (PCWP) among catheterized patients and patient self-evaluation of dyspnea at 3 hours after initiation of study drug among all patients. Secondary outcomes included comparisons of hemodynamic and clinical effects between nesiritide and nitroglycerin at 24 hours. 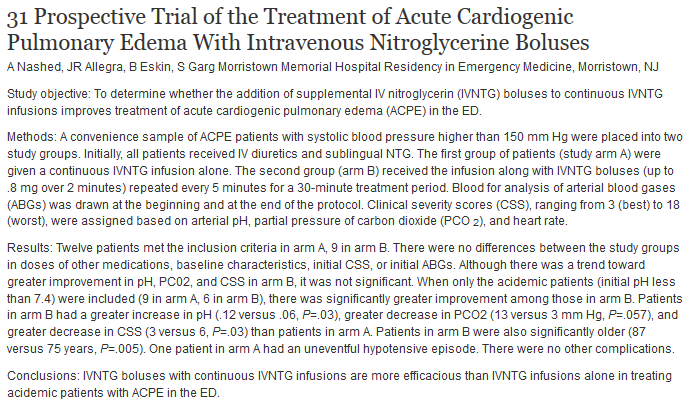 RESULTS: At 3 hours, the mean (SD) decrease in PCWP from baseline was -5.8 (6.5) mm Hg for nesiritide (vs placebo, P<.001; vs nitroglycerin, P =.03), -3.8 (5.3) mm Hg for nitroglycerin (vs placebo, P =.09), and -2 (4.2) mm Hg for placebo. At 3 hours, nesiritide resulted in improvement in dyspnea compared with placebo (P =.03), but there was no significant difference in dyspnea or global clinical status with nesiritide compared with nitroglycerin. At 24 hours, the reduction in PCWP was greater in the nesiritide group (-8.2 mm Hg) than the nitroglycerin group (-6.3 mm Hg), but patients reported no significant differences in dyspnea and only modest improvement in global clinical status. CONCLUSION: When added to standard care in patients hospitalized with acutely decompensated CHF, nesiritide improves hemodynamic function and some self-reported symptoms more effectively than intravenous nitroglycerin or placebo. In one study (Emerg Med J 2004; 21:155-161) survival to hospital discharge was improved with CPAP (10 mm/Hg) over BiPap (Ipap 15 Epap 5) and conventional therapy. The symptoms and signs of heart failure are neither sensitive nor specific and considerably overlap those of pulmonary disease. B-type natriuretic peptide (BNP) is a polypeptide secreted by the cardiac ventricles in response to myocyte stretch, resulting from ventricular volume expansion and pressure overload. BNP levels are elevated in patients with left ventricular dysfunction, and the levels correlate with both the severity of symptoms and the prognosis. In the largest study to date, the Breathing Not Properly Multinational Study, BNP levels were more accurate than any historical or physical finding or laboratory value in identifying heart failure as the cause of dyspnea. The diagnostic accuracy of BNP at a cutoff value of 100 pg/ml was 83%, with a sensitivity of 90% and a specificity of 76% (1,2). There is a high negative predictive value of a low level of BNP with respect to the diagnosis of heart failure. A BNP level below 100 pg/ml in a patient with acute dyspnea makes the diagnosis of heart failure very unlikely and can help clinicians focus on alternative diagnoses, whereas a level above 500 pg/ml makes the diagnosis of CHF highly likely. For intermediate levels, use of clinical judgment and adjunctive testing are encouraged (4). It should be noted that in patients with severe renal disease, B-type natriuretic peptide levels are increased. Therefore, higher cutoff values need to be identified for this important patient population. (1) Maisel AS, Krishnaswamy P, Nowak RM, et al. Rapid measurement of B-type natriuretic peptide in the emergency diagnosis of heart failure. N Engl J Med 2002;347:161-167. (2) McCullough PA, Nowak RM, McCord J, et al. B-type natriuretic peptide and clinical judgment in emergency diagnosis of heart failure: analysis from Breathing Not Properly (BNP) Multinational Study. Circulation 2002;106:416-422. (3) Mueller C, Scholer A, Laule-Kilian K, et al. Use of B-type natriuretic peptide in the evaluation and management of acute dyspnea. N Engl J Med 2004;350:647-654. Comparison of BNP vs. ECHO. (J Am Coll Card 40(10):1794, Nov 20,2002) Use <80 no CHF, >300 CHF, in between grey zone. BNP 12% missed, physical exam 15% miss. Remember that either ventricle failing will produce BNP so any patient with cor pulmonale from copd will also have elevated bnps. B-type is so named because it was first isolated from porcine brains, mostly secreted from ventricles. I use the BNP both to rule in and to rule out CHF. So, in the example of the patient who has chronic lung disease and who has rales that might be “wet” or “dry” and a chest x-ray that shows interstitial markings that could represent fibrosis or fluid (and no priors for comparison, of course): a BNP less than 100 satisfies me that the patient probably does not have CHF, while one greater than 500 (or, better yet, 1,000) strongly suggests that the patient does, indeed, have CHF. Values between 100 and 500 are not very useful. Although our lab reports the results with a cut-off of 100 between normal and abnormal, I consider values between 100 and 500 to be indeterminate. Data Synthesis Many features increased the probability of heart failure, with the best feature for each category being the presence of (1) past history of heart failure (positive LR = 5.8; 95% confidence interval [CI], 4.1-8.0); (2) the symptom of paroxysmal nocturnal dyspnea (positive LR = 2.6; 95% CI, 1.5-4.5); (3) the sign of the third heart sound (S3) gallop (positive LR = 11; 95% CI, 4.9-25.0); (4) the chest radiograph showing pulmonary venous congestion (positive LR = 12.0; 95% CI, 6.8-21.0); and (5) electrocardiogram showing atrial fibrillation (positive LR = 3.8; 95% CI, 1.7-8.8). The features that best decreased the probability of heart failure were the absence of (1) past history of heart failure (negative LR = 0.45; 95% CI, 0.38-0.53); (2) the symptom of dyspnea on exertion (negative LR = 0.48; 95% CI, 0.35-0.67); (3) rales (negative LR = 0.51; 95% CI, 0.37-0.70); (4) the chest radiograph showing cardiomegaly (negative LR = 0.33; 95% CI, 0.23-0.48); and (5) any electrocardiogram abnormality (negative LR = 0.64; 95% CI, 0.47-0.88). A low serum BNP proved to be the most useful test (serum B-type natriuretic peptide <100 pg/mL; negative LR = 0.11; 95% CI, 0.07-0.16). Conclusions For dyspneic adult emergency department patients, a directed history, physical examination, chest radiograph, and electrocardiography should be performed. If the suspicion of heart failure remains, obtaining a serum BNP level may be helpful, especially for excluding heart failure. Unilateral Pulmonary Edema Common teaching states that a unilateral alveolar or interstitial infiltrate is most likely a result of pneumonia, and not pulmonary edema. However, unilateral pulmonary edema has been well documented, and can result from a myriad of causes. Described causes of unilateral pulmonary edema include congestive heart failure (1), severe mitral valve insufficiency (2), upper airway obstruction (3), pulmonary artery compression from aortic dissection (4,5), pulmonary venous obstruction from mediastinal fibrosis (6) neurogenic pulmonary edema (7), and amiodarone-related (8) and heroin-related (9) pulmonary edema. Thus, even if the pulmonary opacities are unilateral – and even though radiology may read the x-ray as exhibiting llikely pneumonia – if the clinical manifestation is compatible with pulmonary edema and not with pneumonia, early and aggressive treatment should be initiated for pulmonary edema. References: (1) Nitzan O, et al. Unilateral pulmonary edema: a rare presentation of congestive heart failure Am J Med Sci 2004;327:362364. (2) Legriel S, et al. Unilateral pulmonary edema related to massive mitral insufficiency Am J Emerg Med 2006;24: 372. (3) Morisaki H, et al. Unilateral pulmonary edema following acute subglottic edema J Clin Anesth 1990;2: 4244. (4) McTigue C, et al. Unilateral pulmonary edema associated with pulmonary arterial compression Australas Radiol 1988;32: 390393. (5) Takahashi M, et al. Unilateral pulmonary edema related to pulmonary artery compression resulting from acute dissecting aortic aneurysm Am Heart J 1993;126: 12251227. (6) Routsi C, et al. Unilateral pulmonary edema due to pulmonary venous obstruction from fibrosing mediastinitis Int J Cardiol 2006;108: 418421. (7) Perrin C, et al. Unilateral neurogenic pulmonary edema. A case report Rev Pneumol Clin 2004;60(1):4345. (8) Herndon JC, et al. Postoperative unilateral pulmonary edema: possible amiodarone pulmonary toxicity Anesthesiology 1992;76: 308312. (9) Sporer KA, Dorn E. Heroin-related noncardiogenic pulmonary edema: a case series Chest 2001;120: 16281632. Clin Nephrol. 1997 Jan;47(1):47-9. Phlebotomy for pulmonary edema in dialysis patients. Eiser AR, Lieber JJ, Neff MS. Source Department of Ambulatory Care, Elmhurst Hospital Center, NY, USA.